TAO Dance Theatre’s two works, 6 and 7, on the Dance Umbrella program are an uncompromising integration of concept and movement. This is how Artistic Director Tao Ye puts it in words: ‘I deeply understand the narrowness of the individual, and that the possibilities of humanity are created precisely within the limitations of that narrowness. The body, the physical existence that bears within itself the intrinsic order of life, is where the greatest wisdom lies.’ In distinguishing the wisdom of the body from the narrowness of the individual, Tao Ye equates dance with wisdom and his work can be construed as giving that wisdom a physical form while eschewing the dominance of the individual. This approach precludes the possibility of narrative because there is no subject to narrate: this is dance as a purely visual form. The proscenium becomes a frame and the lighting fills the frame with a painterly wash — engulfing the dancers in a masterly fog in 6 and highlighting them in shadowless light in 7. The sense of two dimensions is enhanced by Tao Ye’s approach to colour: ‘We live in an era of dazzling colours; my chosen path of thought in such an era is to create a single distilled colour.’ 6 is a study in grey and black, 7 in white. In formal terms, Tao Ye reduces the planes on which the dancers perform to a single line from which they never break free (nor from each other): ‘When it comes to pluralism versus binary opposition, I believe more in the existence of the single unitary.’ This heady package of philosophical concepts with parallels to traditional Chinese landscape painting challenges western ideas of space, perspective, being and eternity. It is, however, the radical integrity of the concept that gives 6 and 7 a calming, meditative quality. Tao may be the name of the company’s founder, but it also signifies — in its English spelling at least — a universal principle. Within this carefully constructed conceptual framework the choreography is remarkably fluid. The six dancers in 6 (and the seven in 7) are of similar heights and qualities, dressed in long stretchy costumes that transmute gender and individuality into a single (binary) form. They move in unison throughout and because their bodies are so supplely articulate they undulate together like a single organism with several heads. In both works their hands are held close to the body so the entire visual vocabulary remains focused on the pliant vertical axis of the body, from freely rolling head to planted foot. Ellen Ruge’s lighting for 6 is allied closely to the choreography, controlling the opacity of the fog, picking out the moving heads like glints of armour, highlighting hands and faces, stretched-up necks or the fineness of the jaw. With backlight Ruge detaches the group from the fog to focus our attention on the willowy forms of the dancers, their subtle changes of direction and unexpected variations, always in mesmerizing unison, always in the same relationship to one another. Xiao He’s throaty, sonorous score is neither subservient to the choreography nor overpowers it; it seems to exist within the bodies of the dancers and like them never tires. There is a point at which the dancers stop suddenly; they backbend and roll through their hips to kneel in one fluid movement. Their knees gently touching the floor is a rare punctuation but when the music starts again they slowly roll up to the vertical and continue without any sense of exhaustion as if the tide has just turned. The score is the only element that carries a sense of beginning and end (one feels the dancers could go on forever) and it heralds the end with a frenzied passage of bowed strings. The dancers hinge to their knees once again but when they rise they slowly recede into the dusk as the music fades. After the curtain descends there are no bows. The relationship of the dancers is with the plane in which they move and with each other, like a painting in a gallery. We do not applaud a painting but it is a convention of the theatre that Tao Ye cannot control. Before the curtain rises on 7, there is a cryptic announcement that for this new work the choreographer would appreciate if the audience would remain silent as any noise will affect the performance (it turns out that the dancers create their own score with their voices that are amplified by overhead microphones). 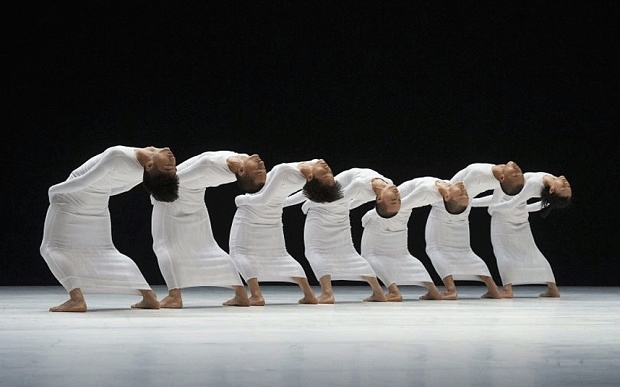 The curtain rises on a stunning opening scene in white, brightly lit (by Ma Yue), with seven dancers in long, white, stretchy costumes on a white floor. There is an irrepressible burst of laughter in the audience. From this point on, the formal elements of 7 follow closely those of 6. The dancers once again form a single entity in a single plane and the unison movement is equally fluid…and equally mesmerizing. The addition of the dancers’ voices is eerily beautiful, but haven’t we just been down this philosophical route in the first half? Tao Ye states that ‘…through my work I hope to return attention to the essence of the process of sensing and perception — what makes dance truly express its purity and progression. When we allow ourselves the freedom to see without controlling pre-conceptions, only then can we experience a genuine dialogue with the true nature of what is in front of our eyes, and finally begin to walk into the infinite unknown.’ It is perhaps Tao Ye’s explicit purpose to emphasize in white the concepts he has covered in black and grey as he progresses towards ‘the infinite unknown’, but on the choreographic side this suggests a limiting form for the wisdom of the body. I have not seen Tao Ye’s works 1 through 5, but on the evidence of 6 and 7, his choreographic conception seems too self-referential to allow for the freedom he espouses.